By James L. Pocrass, Esq. On Oct. 7, 2015, Governor Jerry Brown signed Assembly Bill 1096 that gives two of the three classes of electric bikes the right to access bike paths and bike lanes. This is the first of its kind of legislation in the country, and it is a sign that e-bikes are coming of age. Type 3: Pedal-assisted bikes with a maximum assisted speed of 28 mph. As of 2017, electric bike manufacturers must label e-bikes as a Type 1, 2, or 3. 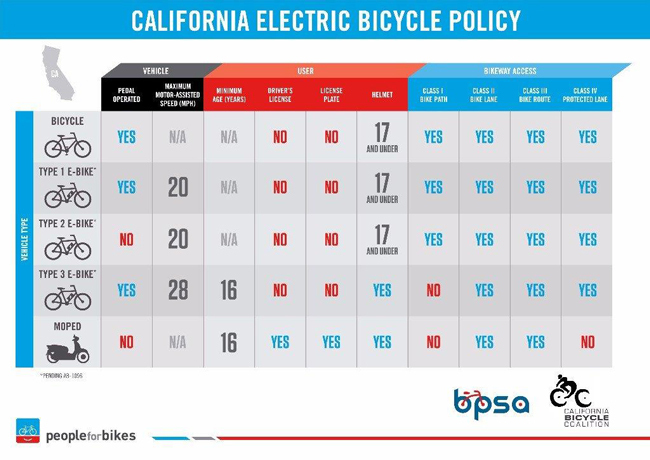 The infographic below by People for Bikes and the California Bicycle Coalition explains the policy more completely. E-bikes are gaining in popularity, and not just with seniors, people with injuries or disabilities, families, and those who have particularly long or uphill commutes. These bikes are quickly going mainstream because they’re fun to ride and adaptable to various conditions. Bike paths and roads that are not under federal or state vehicle codes (an example would be a bike path in a county park). Natural surface paths in parks, like mountain bike trails, and open space areas. Most importantly, counties, cities and other government entities still have the right to regulate e-bikes, just as they have the right to regulate bicycle usage with their domains. Since we’re discussing e-bikes’ rights and responsibilities under the law, let’s go a little further. In 2001, the United States Congress passed Public Law 107-319. It stated that electric bicycles and tricycles that meet the definition of low-speed electric bicycles are regulated by the federal Consumer Product Safety Act versus mopeds and motorcycles that have the ability to exceed the speed of an electric bicycle. The latter are regulated by the Department of Transportation and the National Highway Traffic Safety Administration. States then passed their own laws regulating e-bikes. In California, low-speed (up to 20 mph) e-bikes have all the rights and responsibilities of a motor vehicle, just as a bicycle does. E-bike riders do not need a driver’s license, license plate or insurance. You must be at least 16 years old to ride an e-bike, and if you are age 17 or younger, you must wear a bicycle helmet. Now with AB 1096, you can ride an e-bike almost anywhere you can ride a bicycle. But remember, all the traffic laws – from stop signs to traffic signals and to phone and text use and from riding with traffic and having working brakes, handlebars, and lights on your bike – all apply to you on your e-bike. There are a couple of potential legal issues that I see facing e-bike riders. The most important one in my mind is the issue of insurance. As I said, no insurance is required for an e-bike in California. I have read online that dealers believe that if your e-bike is stolen, it is likely that your homeowner’s or rental insurance policy would cover the theft. They do suggest that you contact your insurance agent to confirm that. My apprehension is whether your uninsured motorist insurance would cover you if you are in a collision and the driver of the motor vehicle is either uninsured or doesn’t have enough insurance to cover you if the collision results in serious injuries or a wrongful death. A cyclist riding a bicycle who has a collision is covered by his/her uninsured motorist insurance. Is a cyclist on an e-bike similarly covered? This is a very important point, and it’s why we always recommend that a cyclist increase his/her uninsured motorist insurance as high as their insurance company will permit. It’s pennies on the dollar and if you’re in a collision, it could mean that you have a much easier time of restarting your life. Your uninsured motorist insurance kicks in if the driver does not have insurance, if the driver does not have enough insurance to cover the damage he/she caused, or in the event of a hit and run when the driver is not found. Does your uninsured motorist insurance cover you on an e-bike? I urge you to contact your insurance agency and ask. If they say “yes,” get it in writing! It is also worth noting that regardless of what type of bike you are riding, it is illegal to ride under the influence of drugs and/or alcohol. Besides the obvious, I see a potential legal issue here also. In 1985, California passed Vehicle Code 21200.5, which made cycling (or bicycling) under the influence a CUI rather than a DUI. A CUI is a misdemeanor and it will show up on your record as a conviction. It also carries a $250 fine but no jail time. If the individual is under 21, a CUI conviction can result in the suspension of the person’s driver’s license. In my mind it is unclear whether riding a Type 1 or a Type 2 e-bike under the influence of drugs and/or alcohol would be categorized as a CUI or a DUI if you were stopped by law enforcement. Cal. Veh. Code § 231, specifically defines a bicycle as a device upon which any person may ride, propelled exclusively by human power through a belt, chain, or gears, and having one of more wheels. It says that persons riding bicycles are subject to the provisions of this code (CUI) specified in Sections 21200 and 21200.5. A moped rider who is under the influence is subject to the drunk driving laws (DUIs). This was decided in 1977 by the California Court of Appeal in People v. Jordan, 75 Cal. App.3d Supp.1. The court specifically stated that because it had a motor it did not fall under the CUI law. There doesn’t seem to be any law on the books at this time that would remove Type 1 or Type 2 e-bikes from DUI law. My best advice would be to not test the law and to not ride under the influence of alcohol and/or drugs (illegal OR prescription drugs). So the next time you see an e-bike in a bike lane, remember, it, too, has the right to be there. For more than 25 years, Jim Pocrass has represented people who were seriously injured, or families who lost a loved one in a wrongful death, due to the carelessness or negligence of another. Jim is repeatedly named to Best Lawyers of America and to Southern California Super Lawyers for the outstanding results he consistently achieves for his clients. Having represented hundreds of cyclists during his career, and Jim’s own interest in cycling, have resulted in him becoming a bicycle advocate. He is a board member of the Los Angeles County Bicycle Coalition. For a free, no-obligation consultation, contact Jim Pocrass at 310.550.9050 or at [email protected].